You’ve played it once, you may have played it twice, but are you ready to play it thrice? Hyrule is falling to the same darkness as twice before, but this time it’s coming to you anytime, anywhere, and with anyone on Nintendo Switch, in Hyrule Warriors: Definitive Edition. Is three times the charm, or is Hyrule Warriors: Definitive Edition more barren and dilapidated than the aftermath of a Hyrule battleground? Find out in our review, after the break! If you have yet to enter the battlefield in Hyrule Warriors for Wii U or Hyrule Warriors Legend for 3DS, let me fill you in. Instead of exploring a vast and open world full of dungeons and puzzles, you’ll instead lead Hylian troops on the battlefield to keep dark forces at bay. The dark sorceress, Cia, has her heart set on the hero of legend to resurrect the king of darkness. A rift in time and space was created to gather the tools necessary from three different eras to bring down a new era of darkness. Team up with the Hyrulian forces, Lana the sorceress of Light, and other friendly characters from the history of Zelda in long battles, and command ally forces to throttle Cia’s plans. As you are probably aware, Hyrule Warriors is unlike any Zelda game before. You are tasked with fighting hordes of enemies by using a barrage of varied attacks. Control multiple characters across the battlefield, command other main allies with simple commands to make battles more manageable, and capture keeps to push back your foes. The game’s Legend Mode (the main story) takes an episodic format where every episode contains a main objective to complete, such as defeating the enemy commander, and several missions to undertake, these can be fairly simple such as escorting a Bombchu to an explosion site and defeating a large enemy, but you may also receive some more obscure missions, such as having to search for covert agent turning your own troops against you. To help you on your adventure, you’ll be needing to overpower enemy keeps, doing so will boost your troops forces. Taking a keep is easy, all you have to do is just defeat a certain amount of enemies in that keep to summon the Keep Boss, then just defeat the Keep Boss to claim the keep your own. Most levels will have you closed off from certain areas and keeps, though taking keeps and completing missions will open areas up, allowing you to move further onto the breach. Some scenarios will get fairly tricky later on as there will be special enemy types, such as giant bosses like King Dodongo, summoners that will summon up tough enemies, keep saboteurs which will take down your captured keeps more quickly, and much more. Luckily, most scenarios will allow you to command and play as additional characters on the fly so you can keep an eye on the battlefield. Fighting itself is pretty simple. You have your regular attacks and your strong attacks, your regular attacks can be stacked up to make combos, and you can also add strong attacks to make even more powerful combos, some of which may even affect your regular strong attacks, depending on the weapon you have equipped. Every character has several weapons to choose from, and some weapons include skill slots thats add special effects to weapons. You can also fuse weapons that have empty skill slots to mix and match effects. You can use the Rupees and materials looted from enemy corpses to create badges for each character. Badges aid you in battle by adding various effects, such as unlocking new attacks, raising defence against certain elements, and decreasing the time it takes to deplete a large enemy’s Weak Point Gauge. Though the gameplay may seem fairly repetitive at first, it is oddly addicting and satisfying to see how many of Cia’s minions you are able to defeat while completing the various trials set before you. It’s a brilliant stress reliever! If you want more interesting but shorter battles, then be sure to check out Adventure Mode. Here, you will be placed onto a 8-Bit map of an old Zelda game, such as the original Legend of Zelda or Wind Waker, and each square will have a different challenge. Maybe you’ll need to defeat a bunch of giant bosses, or maybe overthrow a certain amount of enemies in a period of time, who knows! How well you perform will determine your grade and rewards. You can unlock new costumes, weapons, rupees, and even more challenges. You can also nurture fairies to assist you better during Adventure mode. Now, you may or may not be wondering just what makes this the Definitive Edition. Quite simply, Hyrule Warriors: Definitive Edition contains everything that was in Hyrule Warriors for Wii U and Hyrule Warriors Legends, aside from stereoscopic 3D of course. That means that this version contains every Legend Mode story (including Linkle’s Story and the Saga of the Great Sea), every adventure map, every character, every costume, every everything! Even Challenge Mode, which was absent in the 3DS version, which comes will some ultra-difficult challenges (hence the name). The entire game runs flawlessly too, especially in docked while locked at 60FPS. The only time I noticed a couple dips in frame rate were during some in-game cutscenes while in portable modes, other than it’s smooth as butter! Obviously this is a massive upgrade from the 3DS Legends version, and perhaps even a tad of an improvement from the original Wii U version. Though the Definitive Edition does include EVERYTHING from the previous two outings, other than the Breath of the Wild inspired Link and Zelda outfits, there is no new content. 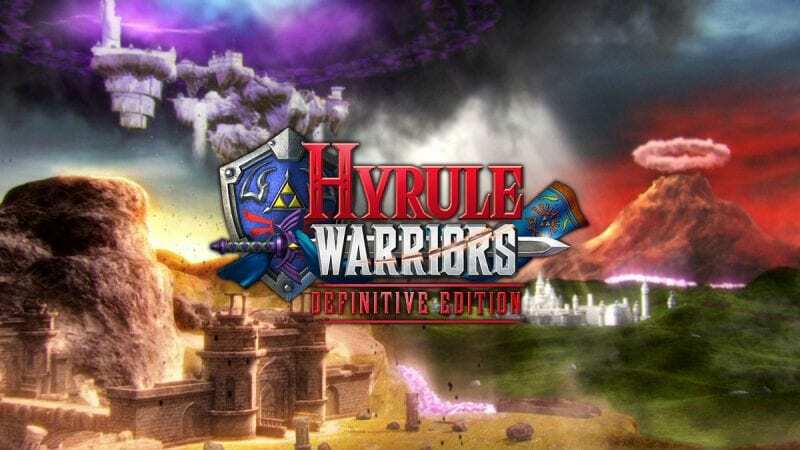 That’s not to say there could be new exclusive DLC or updates, but as of when this was written, there is no additional content that was not included in either Hyrule Warriors on Wii U or Hyrule Warriors Legends on Nintendo 3DS. The name is rather suiting, Hyrule Warriors: Definitive Edition is definitely the strongest entry in the Hyrule Warriors games yet. Not only does it include EVERYTHING from the previous versions, but it also has very fun gameplay. It also plays oh so very smoothly, whether it’s single player in TV mode, or two player co-op in handheld mode. The fact that this version does not seem to add anything new, other than a couple new costumes, player who have played everything from the previous versions, plus all the DLC, may find it difficult to find a reason to pick this up. If you are one of those people who have played through everything in the previous version, or if you just don’t like hack and slash styled games, then it may be best to give this one a miss. On the other hand, if you missed out on one or both of the previous versions (or all the DLC), or if you really want a portable version without having to sacrifice a decent framerate, enemy limits, and co-op, then I would definitely recommend Hyrule Warriors: Definitive Edition! Hyrule Warriors: Definitive Edition releases for Nintendo Switch on Friday 18th May 2018.